Formica® Brand Laminate offers a broader range of looks than ever before. Let Sierra Remodeling transform your spaces with their modern laminates that are as beautiful as they are durable. Mix and match solids, graphic patterns and finishes. Achieve the look you want for any design challenge or budget. Not your Grandmother’s Formica® Laminate Counters! From eye-catching wood looks to contemporary concrete patterns, the 2016 Formica® Residential Laminate collection is comprised of ten beautiful patterns. Review the video to find the surface that is perfect for your next Sierra Remodeling renovation project. Or explore the collection today at http://bit.ly/28Vdn14. 180fx® by Formica Group marks a revolution in surfacing with true-to-scale granite patterns that offer visual drama unmatched by any other laminate. Modern, sophisticated patterns focus on a neutral palette – versatile enough to pair with any Sierra Remodeling interior design concept. Learn how 180fx® by Formica Group came to fruition with the incredible design story, featuring Renee Hytry Derrington, Group Vice President of Design, and Gerri Chmiel, Senior Residential Design Manager for Formica North America. Then, explore the 180fx® by Formica Group collection today and order free samples of your favorites at http://bit.ly/1tEkLmT. 180fx® by Formica Group marks a revolution in surfacing with true-to-scale granite patterns that offer visual drama unmatched by any other laminate. Modern, sophisticated high resolution patterns focus on a neutral palette – versatile enough to pair with any Sierra Remodeling interior design concept. Laminate was invented by Formica Group founders, electrical engineers Daniel J. O’Conor and Herbert A. Faber in 1913. Howard Richter of Sierra Remodeling started installing Formica laminate countertops in 1979 and, he has continued to install them ever since! Follow along as we teach you about the history of Formica® Laminate and how it’s made. Hot topic! Laminate and granite are two very different countertop materials, with some similarities and some differences. 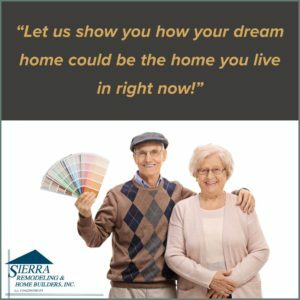 Learn more about each product now and consider all the facts before you plan your next Sierra Remodeling kitchen or bathroom renovation. James Young, TV star and expert contractor, hosts! Basic, affordable materials like COLORCORE®2 Laminate can be used by Sierra Remodeling in highly creative ways to transcend their fundamental practicality. Now more versatile than ever, COLORCORE®2 Laminate offers an assortment of inspiring solid colors and patterns that go all the way through—so there’s no dark edge!